Authorized CompTIA Server+ courseware and learning tools from Axzo, with a 4.9/5.0 score from ProCert. 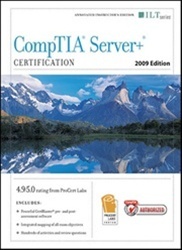 Includes the tools you need to prepare your students for the CompTIA Server+ exam. Included with each courseware set are classroom labs, an instructor's manual, and pre- and post-assessment tools, with over 350 practice exercises and certification-based review questions to ensure that your students are learning what they need to know for the certification exam. Our products are written by experienced learning professionals, with each learning objective thoroughly tested to ensure that you receive the most effective courseware available for your classroom and certification needs.